On Friday, February 1st, our Team Captains in our leadership development program- Take the Lead- participated in a leadership retreat at MB Ice Arena. 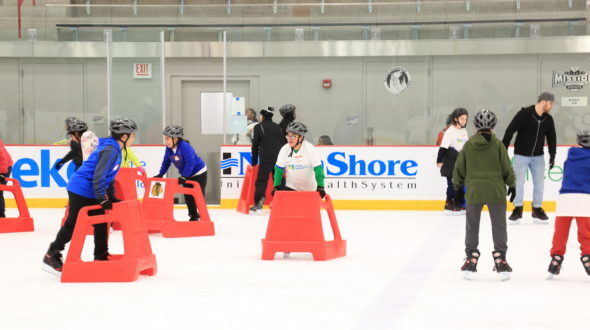 MB Ice Arena is the Chicago Blackhawks’ official practice arena and we were so grateful for the Blackhawks partnership in executing an incredibly successful retreat. After a quick bite of breakfast, our Team Captains jumped into the activities for the day. We partnered with 826Chi- a non-profit creative writing, tutoring, and publishing center dedicated to amplifying the voices of Chicago youth- to provide Captains with the opportunity to practice their writing skills. Specifically, Team Captains worked on using writing as a form of stress management. Stress management is a critical component of the Take the Lead program as we work to ensure that participants are ready for high school. Then, Team Captains had the opportunity to tour the facility. They saw the Blackhawks’ locker rooms, the players’ kitchen, and the gym. Blackhawks staff explained some highlights of the team’s culture, including the rule about not stepping on the Blackhawks logo in the locker room which is said to be bad luck! Finally, our Team Captains got the chance to do some ice skating! Some Team Captains were pros and were quickly speeding away on their skates, and others were novices on the ice, but bravely tried something new. Everyone had a ton of fun skating! Urban Initiatives loves the opportunity to expose our participants to new sports and physical activities, and the Blackhawks did an incredible job facilitating ice skating for beginners and pros alike. We ended the day with a pizza lunch that included lots of laughs about triumphs and falls on the ice. Several of our Team Captains with exceptional performance in the Take the Lead program had the extra special opportunity to eat with Urban Initiatives’ Partners Board member, Sean Harness. During the lunch, Team Captains got to play a couple of games with Sean and learn about his professional background. Sean shared his professional journey with our participants and asked participants to think about who their role models were and what they want to do when they are older. The luncheon with Sean was a really positive, collaborative space for some of our Team Captains to start thinking about college and career pathways. We are so grateful to Sean for his participation in this fun lunch and learn! Despite some incredibly chilly temperatures last week, we had over 100 Team Captains from across Chicago come together for this fun day of learning and new experiences. We would like to give our most sincere thanks to the Blackhawks for being such generous hosts. Everyone had so much fun and it wouldn’t have been possible without the generosity and help of the Blackhawks staff. Previous Article: 2019 Soccer Ball is Huge Success at New Venue!